Japan-based TDK is rumored to be offering $12 per share. It's been a rough couple of years for InvenSense (NYSE:INVN). The micro-electro-mechanical systems (MEMS) maker has stumbled for a number of reasons, including significant pressure from its largest customer, Apple. We're talking about nearly 60% of sales coming from the iPhone maker last quarter, up from "just" 34% a year ago; the reliance on the tech titan is only growing. As many suppliers have learned the hard way, getting in bed with Apple is a double-edged sword: The company is infamous for squeezing suppliers and using its sheer size as negotiating leverage, while small suppliers like InvenSense have much less bargaining power. Both revenue and gross margin have been falling for many quarters, and fears of commoditization for gyroscopes and accelerometers continue to hurt InvenSense's ability to differentiate. Even beyond the iPhone titan, InvenSense relies heavily on the smartphone market, which is also showing signs of maturing. Shares are soaring today on speculation that InvenSense may be put out of its misery, with investors welcoming a possible acquisition. Reuters reports that Japan-based TDK is in discussions to acquire InvenSense, citing anonymous sources. TDK already manufactures a wide range of smartphone components such as GPS front-end modules, thin-film RF components, and batteries, among many others. Adding MEMS to the mix makes plenty of sense, as it would expand TDK's product portfolio, potentially allowing the company to win even more content in mobile devices. TDK has been growing its sensor portfolio via several acquisitions over the past few years, and InvenSense has been trying to sell itself for a little over a month now. The company said in October that it had hired a financial advisor to evaluate "indications of interest." According to the report, TDK is offering $12 per share, although the two companies are still negotiating and nothing has been finalized. Of course, as with all acquisition speculation, this report should be taken with a grain of salt, because nothing may materialize. Investors are factoring this uncertainty in; shares are currently trading around $10.50, well below the rumored offer price. The news comes at a time when the broader semiconductor sector is undergoing unprecedented levels of consolidation as companies seek to grow profitability by combining in order to reduce combined costs through synergies. 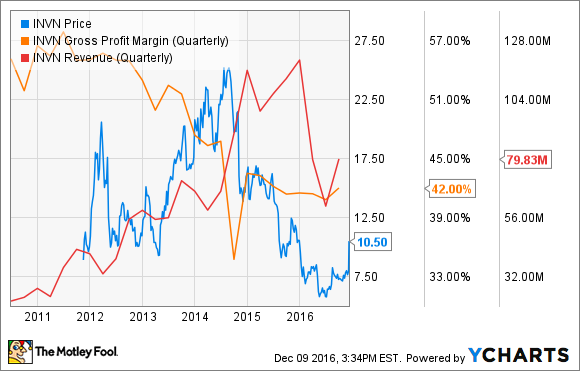 InvenSense's business has been deteriorating due largely to factors outside of its control. It's hard to imagine the company's business recovering to prior levels in a sustainable way, which also means that its stock price would have a hard time recovering, too. Shares topped out around $26 in 2014 after InvenSense went public in 2011. If the odds of a meaningful recovery are remote, then perhaps getting taken out at $12 per share is the best possible ending to InvenSense's short public life.